In a Dutch oven or heavy bottom casserole, heat 3 tablespoons oil over medium-high heat. Add the beef, and begin to brown on all sides. After 2 to 3 minutes, add the ground meat, sprinkle with salt and pepper, and let it brown along with the cubed meat for another 5 to 6 minutes. The juices of the ground meat should have come out and then dry out. Stir as the meat browns. Make room in the center of the pan, add the extra tablespoon of oil and add the onions and peppers, cook for 5 more minutes or until they begin to soften. Make some room in the casserole again, add the garlic, red pepper flakes, cayenne, paprika, chili powder, chipotle sauce, cumin, oregano, stir well. Add the crushed tomatoes, tomato paste, sugar and vinegar, mix well and cook for 3 to 4 minutes stirring a couple times. The tomato paste should have dissolved and the sauce thickened a bit. Pour in the beef stock and once it comes to a strong simmer, reduce heat to medium. Add the beans and stir. Lower the heat to medium-low, it should have a low steady simmer, and cook uncovered for an hour, stir every once in awhile. Serve the chili in bowls and let your guests garnish with sour cream, cilantro, shredded cheddar cheese, tortilla chips and green onions. Made this for dinner the other day. Only one word for this.. Delicious! Hi Pati, Greatings from cold Wisconsin! I just made the chili and the poblano cornbread for watching the Super Bowl. Both recipes are delicious! I really enjoyed the layering of spices and my husband went back for seconds. Thank you for your wonderful tv show. In these turbulent times, your joy and pride in your culture and countries is much appreciated. We hope to look forward to many more seasons. Oh thank you so much for your kind words, Laura! I hope you are staying warm. Oh I’m sorry you think that, James. I hope you give it a try and enjoy it. Just made the Tex-Mex Chili: As usual, your recipe, is spot-on! I have never been disappointed by any of your recipes, and I have tried many. Oh wow. Thank you so much Loyal! Pati they only thing that would make this better is black beans for a richer flavor . Go for black beans, Jose! I made this yesterday for my family and I. I also made the cornbread to go with it. Both were amazing!! I am definitely making this again in the near future. Also, hello from a fellow Texan! Awesome, Sam! So glad the whole family enjoyed it. Pati, I would like to try this recipe but I need a suggestion. My husband and I do not eat meat but we do eat seafood (pescetarians). I know that the way your recipe is written is probably spot on and perfect with beef but I’d like to substitute. Sometimes I use TVP, soy crumbles or some other product that looks like beef but I’d like to know your thoughts. Thank you for always providing delicious recipes! You can use any of your favorite meat substitutes, Liz. Enjoy the chili! I like your TV show! Couldn’t help but look for you recipe for some inspiration on a chili cook off. Its doing the 1 hr simmer now. I already love the taste. Good luck in the cook off Thomas! Preparé este fin de semana para Thomas este Chili, no sabía que esperar puesto que el a vivido siempre en Texas y decía que el Chili de su mamá era el mejor…… pues que crees? Que este Chili le super encanto!!!!!!! Lo acompañamos con tu Poblano bacon cheese corn bread. Me siento super contenta de poder cocinar y presentar un pedacito de Mexico a Thomas en cada platillo. Cada vez comemos menos en restaurantes y ahora pasamos el fin de semana cocinando y le encanta ser mi conejillo de indias 🙈 . Gracias por ayudarme a encaminar la nostalgia que siento por no estar en México a la elaboración de platillos que jamás creí sería capaz de preparar. Pati, this is the best chili I have ever made. 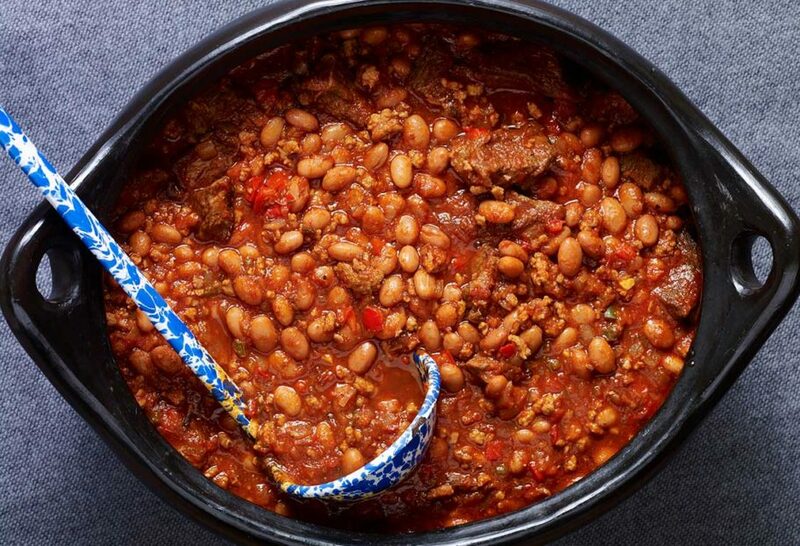 I always felt something was missing in the many chili recipes I have made over the years, but your chili has what I was missing – a very full flavor with so many layers to it. It is amazing! I used ancho chili powder. Thank you for this recipe, I am tossing out all my old chili recipes because this one is a keeper. Oh wow…thank you so much Midge! I love your recipes and show. I can not wait to make this. I will have to do a double batch one for home and one for a chili cook off. Good luck with the cook off Emily! Oh wow! Thank you so much for such a lovely comment Amanda! Thank you for sharing the recipe. It is by far the best chili con Carne I have ever had. Wow, it is so rich on flavour. Five stars. Thanks again. Thank you so much Betsy! 5-stars…I’m honored! Haha thank you Elaina! So glad it is now an easy decision. Best Chili ever! Made it quite a few times. Always a hit! I just watched this episode today (8 September ’15)and for the Texican Chili you use BEEF STOCK. Where did you get it? Was it some you made….or bought? If bought, what brand was it? So happy to hear! Send me a photo of the contest and you and the chili, if you have one to hola@patismexicantable.com !! Thanks Pati! I cooked this with double the ingredients to make my lunches for a week and it is delicious. love the stewing beef, I cooked on a low, low heat for a little over two hours and the beef was falling off the fork. perfect spice balance, rich and filling. Unfortunately I can’t get a hold of pre-made chipotles en abado or pinto beans, so I made my own chipotle paste with dehydrated peppers, and subbed in chickpeas and kidney beans. the recipe is so good though I might make the trip across the city to make sure I have all the ingredients next time. Hola David, So happy to hear you’re enjoying the chili! I’m making this dish again tonight! For years i was not into spicy foods but my husband and I love your show & we’ve been experimenting with different flavors and just love this chili! Thanks for sharing! I finally got to make this Chili. It was absolutely fantastic! I was working up a sweat cooking it as tgere are a lot of ingredients. Next time I will portion out everything before I start cooking. I dont have a dutch oven, so I browned the meat in a pan. My liquids didn’t dry out either, so I transfered the browned meat into a 6 qt. pot, poured the liquid off, and used the same pan to to cook the veggies herbs and tomatoes. I bought whole peeled tomatoes in sauce and crushed them by hand, added that to the pot, cooked that together before I added the stock and the beans. Worked out perfectly. I’m a, single guy living alone, so it fed me for 3 days, and it got better and better by the day. Thank you so much! Will definitely make it again! Tienes alguna receta de cochinita pibil? The absolute best chili I have ever had! I prepared it exactly according to your recipe. What a treat for the mouth! The spices were well balanced and just right for my taste. In the past I have always had chili that was heavier on the cumin and chili powder. Is it OK to use regular chili powder vs chipotle chili powder? So, I haven’t made this yet but my 6 year old son says while we are watching ‘Mom, I’m going to break into the TV and eat that’. I laughed pretty good! Just wanted to say a big THANK YOU Pati! Tried this last night and we loved it! My husband says it’s different from your usual but I love this too! So again Thank you Pati! I really love your show and the recipes you bring to us. Thank you for trying it out, Marie! So happy you guys liked it. My mouth was watering at the thought of eating this chili. I am Mexican and married to a Texican 🙂 I will most definitely be making this for my husband along with the cornbread. YUM! Today was a snow day and I decided to put my unplanned free time to good use and tried your Tex-Mex Chili recipe. Although it is the most complex chili recipe I’ve ever attempted, it is the best! Having said that, it was well worth the effort. I should have followed your recipe a little more closely as far as the one tablespoon of chipotles in adobo sauce goes – I used two tablespoons and it was a little more chipotle than I would have preferred. I also let the chili rest for 30 minutes which allowed the many ingredients to blend and settle. Great recipe! Good use of a snow day! Sp happy you tried it and liked it, Bob. We have made the Chili twice now, once with all beef, and once with ground pork, and absolutely love it. Both times though, I could not get the juices from the meat to “dry out” I was left with quite a bit of liquid each time. I could cook the meat longer to let more juice evaporate, but am afraid that would dry out the meat too much. My only other thought is that perhaps my temperature is too low, but the juice that does come out ends up in a boil. Should I just drain it off? I would just cook the meat a few minutes longer, so juices do dry off. It will not dry the meat as it then simmers with the rest of the ingredients for a while. You may also benefit from cooking in a larger pot, so the juices evaporate quicker. So glad you enjoy the taste! OMG!!!! This is so very yummy. I have watched Pati make it twice and could not go on another day without having it in my kitchen. I made the chili and the cornbread. Tomorrow I will make the pancakes. Thanks, Pati for a great recipe.